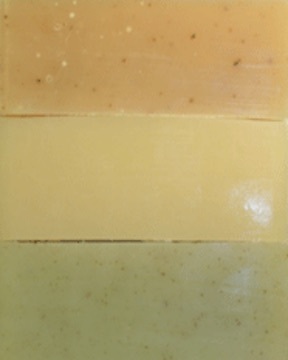 Our Patchouli Soap Blends Trio includes one bar each of three of the following: Patchouli Rose Cream, Patchouli Spearmint Cream, Orange Patchouli Cream, Cherry Patchouli Cream, Lavender Patchouli or any other Patchouli blends we play with! Patchouli essential oil blends wonderfully with just about everything, and creates a scent distinctly different from pure Patchouli used alone in soap. This Soap Trio Gift iincludes three full size soap bars individually wrapped in colorful, coordinating paper cigar bands over corrugating cardboard and stacked inside a clear, cellophane bag, tied with matching color raffia. A gold foil product label identities the soaps inside this soap gift. Olive, Coconut, Palm and Castor Oils, Goat Milk or Shea & Cocoa Butters, Sodium Hydroxide (Lye), Mountain Spring Water, botanicals, fragrances.